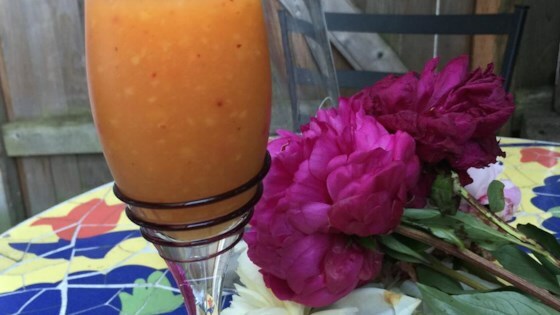 "Frozen peaches blended with peach schnapps and stirred with champagne make a slushie that's a delightful summer cocktail. Garnish with mint." Combine peach chunks and peach schnapps in a blender; blend until smooth. Fill 8 champagne flutes halfway with blended peach mixture. Fill flutes to the top with Champagne. Sparkling & grilled for refreshment! Six cups peaches is about 6 whole peaches, peeled, cut into chunks, and frozen.